Hi to all the fellow XR riders arround the world. Last year arround July I had the opportunity to break in a 2016 XR for a dealership. Earlier this year I ordered my bike and in the period of time that I had to wait, I have spend most of my time watching nearly every review on Youtube as well as in magazines. Ten days ago my bike was ready to be delivered, and yet again fully lived up to my expectations. Very nice, is that a full exhaust or just the can? @Chicken Strip: It's just the Slip-On due to the fact that I dont want to be pulled over on holidays visiting Germany because of faulty CE compliance. I tried to hide the default catalytic convertor by installing a carbon bellypan for thats the only part I don't like so much design wise. I'm liking that belly pan, got a link? Welcome. Did the same as you with that slip on. I think you would agreee that it makes little difference in the sound right ? In any case I have with me the little piece. In general don't think the xr will have you being stoppped by police as it is not that loud coming through the distance. 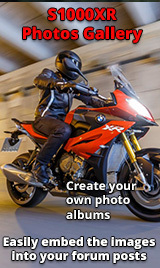 Have a friend with a s1000R and in comparison the XR is like 60% less loud. Also if you use road less noise even due to valve. @ampj8: I was told that only the Slip-On comes with the EC / ECE type of approval. On the website of Akrapovič you can see that the optional headers don't have the approbation marks. When it comes to the sound of the Slip-On I agree that it doesn't differ that much from the stock exhaust, although it has a slight darker grunt to it. The foremost reason was pure for aesthetics, I think I'm not the kind of rider that can set the difference involving the weightloss and slight increase of performance. When it comes to mapping I like Dynamic mode. The gargling sound makes me smile.